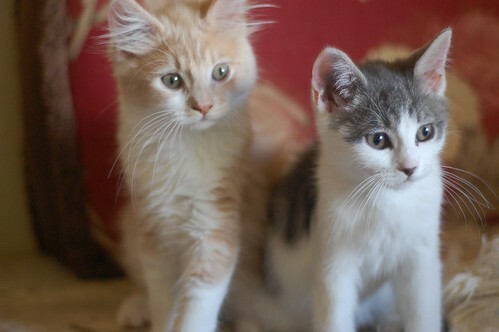 The Itty Bitty Kitty Committee: Bye, Boys! SOOOO remember Alison, who flew all the way from Virginia with her friend Eleanor to come to our house for Tea with The Bean? Well, while they were visiting the northwest, they stayed in Seattle with Alison's friend. This friend had a neighbor who just happened to be looking for kittens and they told her all about the IBKC. 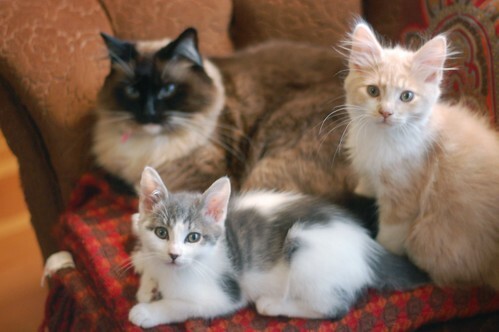 Judy, the neighbor visited our blog, contacted me, met the Furmans, and voila, Teddy and Curtis found their family. Isn't that nice how it all worked out? And now, when Alison visits her friend in Seattle, she'll be able to check in on the boys for us! The boys won't be alone either, they now have a sweet, mellow, black Lab for a sister! There may be some other dogs in their future too because their new family fosters potential service dogs! It's nice to know they've moved in with some critter-loving people. We are so glad they are here - They are fun to watch, and seem to be doing great. Initially I blocked off ouur kitchen with our puppy gate, along with another gate bungied to it so that they could not climb under. It worked great all evening, with me sitting with them in the "reading room" off of our kitchen. And then I tried to leave the kitchen!!!! They climbed right over the gate, and followed me. Now they have run of the house, except for closed doors, and are wonderful. My next door neighbor, a 5 year old, has adopted Teddy - she came over after kindergarten, carried him around, took them both on a "trip to Chicago" to visit a kitten camp (imaginary, of course, carrying them in the kitten carrier). And the dog? Teddy has already groomed her as she lay on her bed, and Teddy is a bit amazed of such a large creature chasing her tennis ball. I will send pictures. Before the boys left, they got some Bean time in. Here are a few pictures of their final cuddle session. Ooh, that is such a heartwarming story! 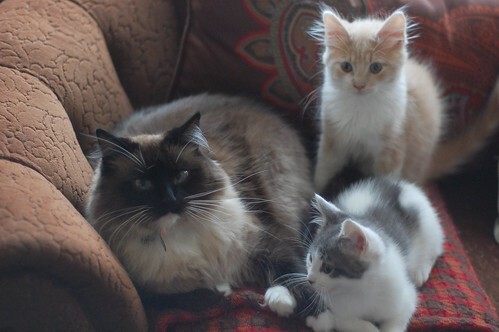 And I'm always amazed at how big the kittens get in their short time with you. Happy day for Curtis and Teddy!!! I am happy for Curtis and Teddy but I will miss them, especially that little scamp Curtis. Glad The Bean got her valedictory in as well! Excellent news! These boys will love having their very own "Labbadore", as my girls used to say. While Potter and Beatrix's dogs are not Labbadores, they love having each other. Way to hit the Jackpot, boys! How wonderful that the boys found such a loving home! It's great that they're getting along with their canine sister, too. I just loooooves happy endings! :) Finally home after 10 days no web. . .
Teddy's used to giant creatures playing with balls - he grew up with Charlene! It touches my heart that 1) the IBKC Community is just a little bigger now and 2) our little guys will be helping other foster animals in the future! Kitten camp in Chicago? Count me in! I agree with Darin--the best part of these stories is that they foster awareness about the adoption community, and how rewarding it can be to get an animal from a shelter or volunteer as opposed to a breeder. What a wonderful story! Congrats to the whole family! I just know those adorable boys will do great with the doggies; after all, they learned from the Bean! Goodbye and have a great life, sweethearts! 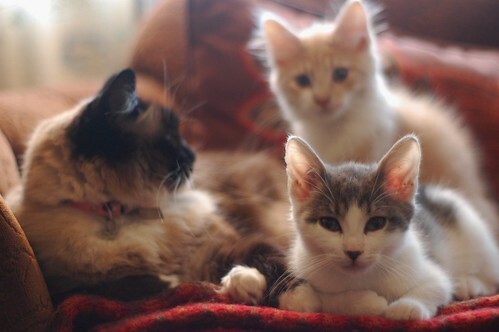 We're back online and happy to see that most of the kittens have their homes. I still don't know how you do what you do without keeping them all. You've had such a variety of sweet personalities just since I've been following you! I guess I'll just stay in love from afar MOL! That's a lovely story! So I guess someone else is getting two VERY FLUFFY cats in Edith and Roland! Wonderful news! Bye-bye, kitties. Be sure to write and send pictures now and again. congrats to Judy on her two new additions. Love the photos of the boys with Miss Bean. So adorable! 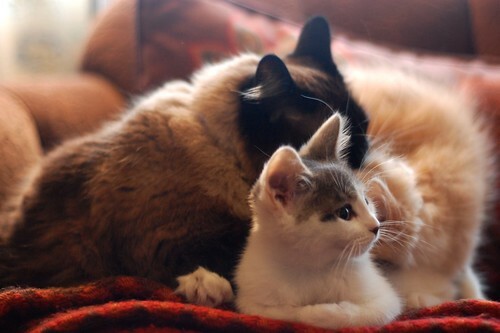 Beanie girl, you are an incredibly loving kitty foster-mom. 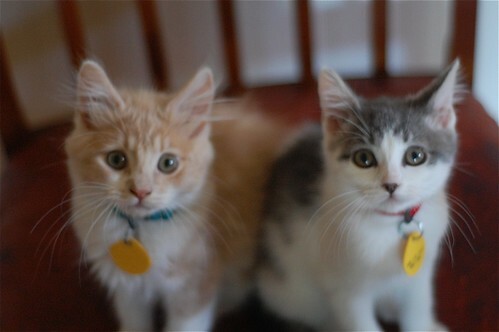 You are helping to send these kittens off on tons of adventures! That first picture of Curtis is a heartbreaker.. the look on his face is: "But... but... I don't wanna leave!!" It's always hard to say goodbye ~ but it warms our hearts to know they have a loving forever home. Good luck boys ~ be happy. Leave takings would be *so* much easier if those darn tags weren't so freakin' huge. 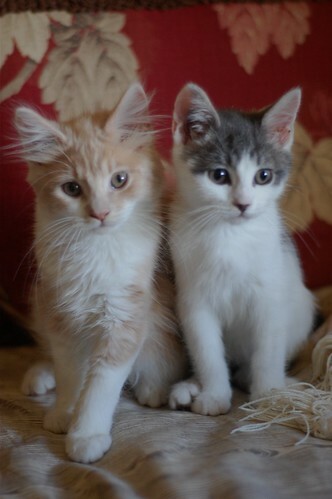 These darling boys are going to bring much joy, and an awful lot of mischief, to their new family. In fact, it sounds like they already have! Yay!